KATHMANDU, Oct 24: Newly-appointed German Ambassador to Nepal Roland Schaefer has pointed out the need to publicize Nepal's successful peace process around the world. Talking to a group of journalists at his office on Tuesday, Ambassador Schaefer said although the issue of transitional justice to conflict victims is yet to be settled Nepal's peace process has already marked major successes after the integration of former rebels in the national army and with the promulgation of the new constitution. “Columbia now is in place where Nepal was 10 years ago. 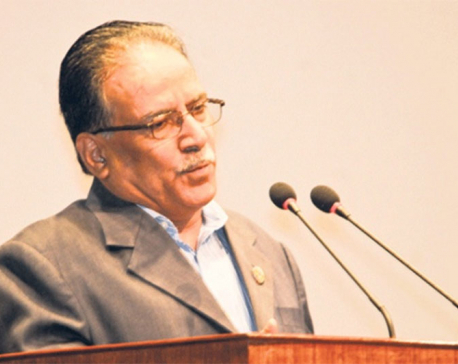 This is something that should make all Nepalis proud about,” he said while lauding the successful peace process in Nepal. Ambassador Schaefer, who submitted his credentials to President Bidya Devi Bhandari on Monday, said Germany will help promote the 'other picture' of Nepal by illustrating the successful peace process as people around the world have heard more negatives that positives about Nepal. "We will help change the current perception about Nepal," he said, pledging Germany's continued support to take the ongoing peace process to a logical end. The envoy also pointed out the need to settle the issue of transitional justice to conflict victims as these issues will continue to haunt for a long time if ignored now. "We are also trying to be political mechanics. I want to position Germany as privileged, respected and forward looking interlocutor on all issues pertaining to peace process," he said. Elaborating his plan during his stint in Nepal, the envoy said he will seek to further strengthen business ties between Nepal and Germany through various measures including business to business contacts. Stating that Germany has been conducting various development activities to benefit Nepali people, the ambassador said business interaction is critically important to make these activities sustainable. “Peace process and business have to be parallel agenda,” he further said. The envoy also shared his plan to further strengthen people-to-people contact between Nepal and Germany. “The European Union is trying to be a new political actor. As Germany is an active member of the EU, it is our national interest to be contributing to the EU. My task is also to promote European Germany in Nepal,” he added.